It looks like jumping the fence surrounding the White House is fast becoming the thing to do if you’re a lunatic or fanatic…or, if you’re just plain stupid. The latest jumper, Dominic Adesanya of Bel Air, Maryland, ended up getting in a fight with two K-9 officers. Mr. Adesanya would be classified a lunatic. This was his third (!) go-around at jumping the White House fence. Last months jumper was, Omar J. Gonzalez. Of all the jumpers over the years, he was the first to make it inside the White House. He was armed with a knife. I classify him somewhere between a lunatic and fanatic. 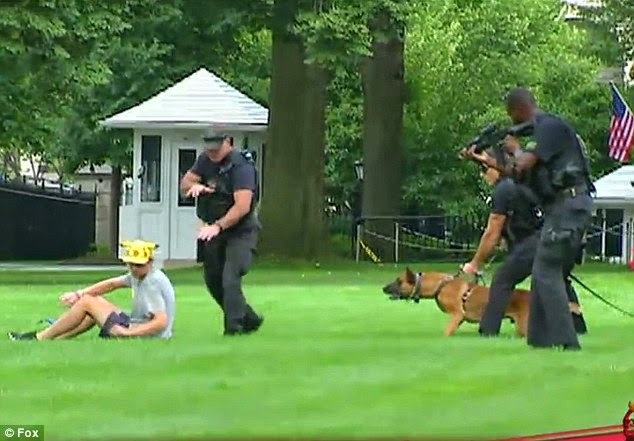 Six people have jumped the White House fence this year. "The Secret Service has apprehended sixteen individuals who have jumped the fence in the last five years. In this age of extremism, any kind of odd thrill quickly ends up either becoming a reality show on TV, or a new sport. With that thought burning a hole in your head let’s take a quick stroll through fantasyland to see how White House Fence Jumping could become a national sport someday! After two years of national competitions open to the public, White House Fence Jumping is more popular than ever before. Several pro clubs have sprung up from various regions in the country. But to keep a cutting edge to the sport it needed ramped up a bit. That’s why national organizers came up with something special – politicians running for their lives in a bid to become the leader of the free world. The upcoming presidential election cycle will feature a group of presidential candidates – Republican and Democrats – in the Jump and Run 100-Yard Category. They’ll have to overcome obstacles like K-9 officers and Secret Service Agents with batons. The idea is to see how badly they want to become president. Survivors will be eligible for the next phase of competition – a freestyle jump over the fence with an emphasis on originality and air time. Fox News and CNN will be sponsoring the competition.